The best part of skiing is that it brings you to new heights, literally. 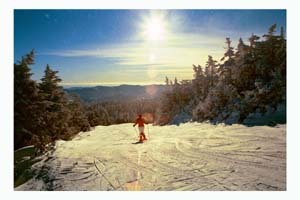 From the summit of Vermont’s ski areas, you can take in the extraordinary beauty of our state. Though not the Rockies, nor the Alps, the Green Mountains have their own wintry appeal. The trails I have selected below represent a few of my personal favorites in Vermont for their fine vistas. 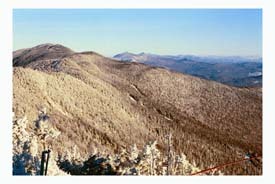 Whether it’s a view of Lake Champlain, the vast forests or the mighty Mount Washington in the distance, (the pinnacle to all other New England summits), each of these trails has unique terrain and outstanding scenery. 1. Rim Run at Sugarbush offers one of the best lookouts in Vermont. From here you have an impressive view of Lake Champlain and across the water, New York ’s Adirondack range of 5000’ peaks. Vermont’s northern mountains, Mt. Mansfield’s Stowe, Smugglers’ Madonna, and Camel’s Hump are perfectly framed from this trail too. 2. Willoughby at Burke Mountain overlooks the Northeast Kingdom of Vermont. The dramatic slope of Mt. Pisgah demarcates Lake Willoughby to the north. The surrounding hills are dotted with farms, so “story book” Vermont. 3. Drifter turns the skier and rider in every angle while descending Madonna Mountain at Smugglers’ Notch. From Drifter, you can look across the Notch at Stowe’s Front Four and the impressive Mt. Mansfield’s 4,395 peak. In visible range, there is also Lake Champlain to the east, and the stately Adirondacks. 4. 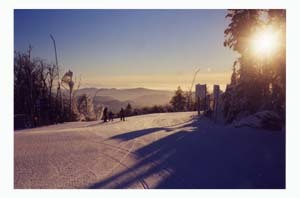 Ridgeview at Stowe makes the list, as the view from this highest peak in Vermont is awe-inspiring. As you ski along the ridge, the views of Stowe valley and the Worcester Mountain range are glorious. 5. Jester zig zags its’ way from the summit of Lincoln Peak at Sugarbush. There is a short climb/traverse at first but its well worth the bird’s eye view of the Mad River Valley, each turn offers a better view than the last. 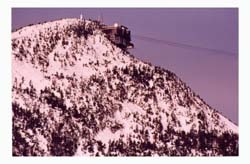 6.Vermonter at Jay Peak takes you from the tram summit, along the ridge toward the triple with a panoramic view of Big Jay off the back side, Lake Champlain and Mt. Mansfield. This is one of the few trails not serviced by the new Green Mountain Flyer, the longest high-speed quad in Vermont. 7. Glades at Pico is a beautiful trail not only for the views but for the perfect framing of trees. There is something magical about this backdrop of birch and fir. 8. Dream Weaver at Okemo is known for beautiful views of Ludlow, Weston, and the Connecticut River valley below. The South facing location and undulating terrain makes this an intermediate favorite. 9. Pipe Dream at Killington Peak is a wide-open cruiser allowing skiers and riders to take in the expansive valley below. This green circle trail is accessed from the K-1 gondola, the highest “lift serviced” elevation reachable in Vermont at 4,141’. 10. Chilcoot at Smugglers’ is not only scenic but also a fun, meandering trail. Gently winding down Smugglers’ Madonna affords you panoramic views of Vermont hillsides, and on a very clear, low ozone day, you may even catch a glimpse of the high rises of Montreal.